Diebold, Incorporated (DBD) provides integrated self-service delivery and security systems and services primarily to the financial, commercial, government, and retail markets worldwide. Diebold is a dividend champion which has paid uninterrupted dividends on its common stock since 1954 and increased payments to common shareholders every year for 58 years. There are only ten companies which have raised dividends for over half a century. 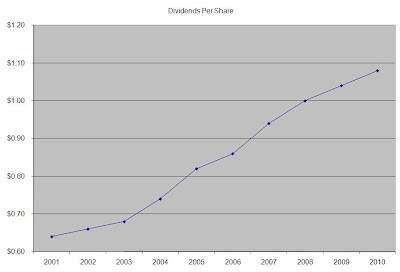 Diebold is the only company in the world which has managed to raise dividends for 58 years in a row. The most recent dividend increase was in February 2011, when the Board of Directors approved a 3.70% increase in the quarterly dividend to 28 cents/share. Diebold’s largest competitors include NCR Corp (NCR), AVID Technology (AVID) and Stratasys (SSYS). Over the past decade this dividend growth stock has delivered an annualized total return of 0% to its shareholders. Just like most other stocks, Diebold was overvalued at the beginning of the decade, which led to poor total returns. Analysts expect Diebold to earn $2.08 per share in 2011 and $2.31 per share in 2012. In comparison Diebold lost $0.31 /share in 2010. The company has managed to consistently repurchase 1.30% of its common stock outstanding over the past decade through share buybacks. The earnings pattern over the past decade has been volatile while lacking any upward trend. Even if analyst’s estimates materialize for 2011 and 2012, the company’s EPS would still be below the 2004 highs of $2.54/share. If Diebold is unable to deliver a sustainable earnings growth over the next decade, it would be unable to continue increasing distributions to its shareholders. 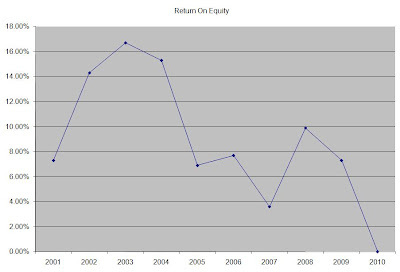 The company’s Returns on Equty have closely followed the deterioration of earnings over the past decade. If the company manages to increase earnings per share past $2, ROE should increase comfortably in the mid to high teen percentage. Rather than focus on absolute values for this indicator, I generally want to see at least a stable return on equity over time. The annual dividend payment has increased by 6% per year over the past decade, which is higher than the growth in EPS. 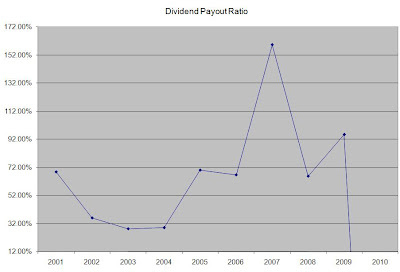 A 6% growth in distributions translates into the dividend payment doubling every twelve years. If we look at historical data, going as far back as 1961, we see that Diebold has actually managed to double its dividend every seven years on average. The dividend payout ratio has remained below 50% in only 3 of the past ten years. 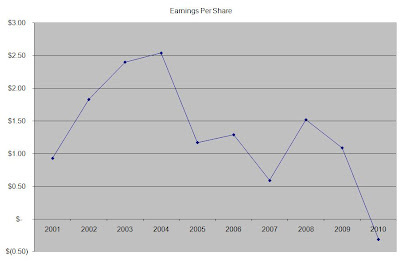 Based on forward earnings for 2011 however, the payout ratio is close to 50%. A lower payout is always a plus, since it leaves room for consistent dividend growth minimizing the impact of short-term fluctuations in earnings. Currently Diebold is trading at 13.90 times 2011 earnings, yields 3.90% and has a sustainable forward dividend payout. The erratic earnings picture over the past decade however makes this stock a hold. If the company's management doesn't manage to increase earnings over the next decade, the company's streak of consecutive dividend increases will have to come to an end.